The flash point of a material is defined as the lowest temperature that vapour from the material can be ignited by a flame or spark. It is one of the properties which can be used to assess any potential fire hazard associated with manufacture, transport, storage and use. Another important and related property is combustibility. Combustibility is one of the properties which can be used to assess any potential fire hazard associated with manufacture, transport, storage and use. Another important and related property is flash point. For the purposes of the Regulations, a product is judged to support combustion if it can be ignited and then continues to burn for 15 seconds after the flame is removed. For flashpoint testing the closed cup test is used. 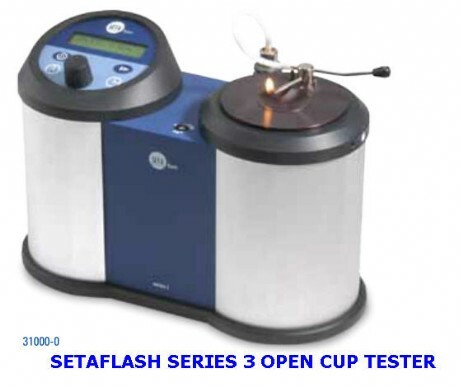 For combustibility testing the open cup tester is used. 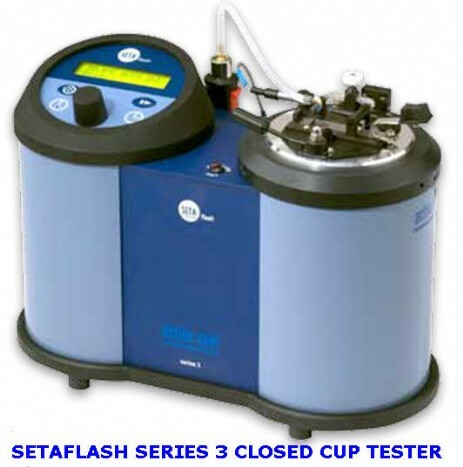 The original Setaflash Series 3 tester. 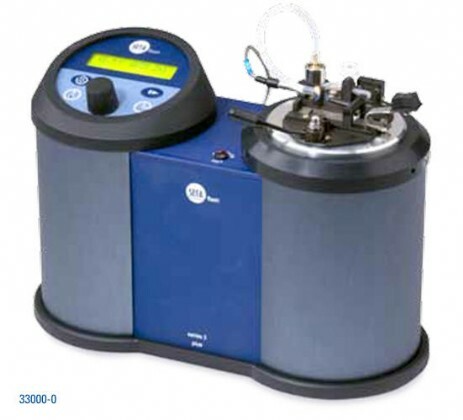 The 30000-0, without the temperature ramp mode, is a simple to use, reliable and cost effective instrument that is to be found in laboratories, refineries, storage and transport facilities world-wide. SUPPLIED WITH: 2ml syringe, mains lead and instruction manual. For close-to-ambient tests the sample cup requires cooling with 13870-0 Seta Coolant Module. 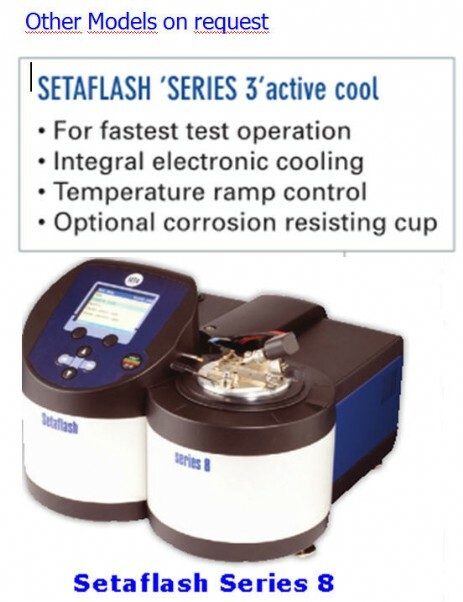 33000-0 Setaflash 3 is an easy to use instrument that can complete a flash/no-flash test in less than two minutes, or determine the flash point of a sample within a temperature range of 0to300°C in typically 8 minutes. All functions are accessed via a two button keypad and the Seta Multifunctional And Rotational Test (SMART) control feature. The digital display shows test parameters, instrument status, and the test result. An audible prompt is sounded when an action is required from the operator. An automatic flash detector reduces the chance of mis-interpretation of the test result by the operator, and enhances repeatability. The temperature ramp mode allows rapid determination of the flash point of a sample in accordance with ASTM D7236 and IP 534. The cup is heated at a rate of 2°C per minute from the start temperature. An audible prompt to carry out a flash test occurs every 1°C rise up to 100°C, every 2°C rise over 100°C. For safety purposes, if no flash is detected when the temperature reaches 40°C above the start temperature, the flash tester automatically terminates the test. A new higher start temperature would have to be entered and the test started again. Gas for the test jet/shutter assembly is supplied from an integral gas tank, which is filled using a standard butane (lighter) refill cartridge. The instrument is lightweight and suitable for mobile use when operated from the optional 12 volt power supply adaptor. SUPPLIED WITH: 2ml syringe, ignitor, mains lead and instruction manual. Note: For close-to-ambient tests the sample cup requires cooling with 13870-0 Seta Coolant Module. Test methods specified under UN and IATA Dangerous Goods Regulations, and others, determine whether a liquid sustains combustion when heated and exposed to a flame under specified test conditions. Certain substances classified as Flammable by Closed Cup Flash Point Testing may be reclassified as non-flammable by combustibility testing. This has significant potential cost implications for the packaging, storage and shipping of many substances. SUPPLIED WITH: 2ml syringe, test flame height gauge, mains lead and instruction manual. CANNON Instrument Company can now provide Flash Point Reference Materials for calibrating Flash Point Testers. The data provided for each standard includes the average flash point for the lot and the standard deviation observed from 20 tests in 10 different laboratories. Nominal flash points for the various standards are shown in the accompanying table. The four standards with lower flash points are made from high purity alkane materials, while the two standards with higher flash points are made from narrow distributions of decane oligomers. A total of six different standards are available for the following ASTM methods: ASTM D 56, ASTM D 92, and ASTM D 93. Flash Point Standards are sold in 200 mL bottles (155 g).